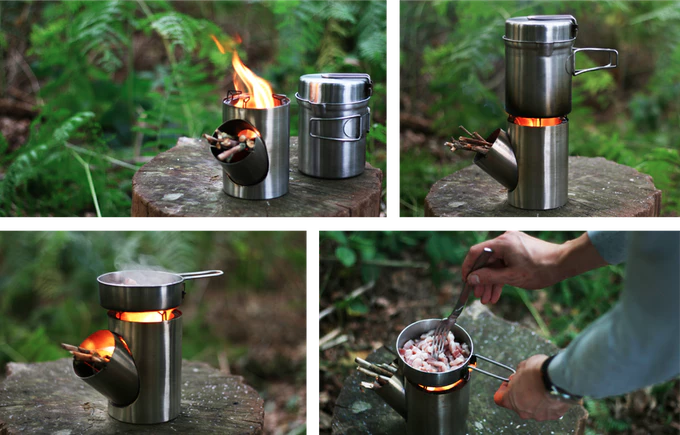 Campers, adventurers or anyone else looking for a portable, lightweight cooking set may be interested in a new piece of kit created by Arnaud, called the Kombuis. Which takes the form of a portable, compact and efficient rocket stove set that offers a wood stove and a small pot and pan constructed from magnesium alloy. The stove has been designed to function naturally and requires no batteries or fans and relies on airflow which is generated and pushed under the burning wood, so the fire burns hotter as more oxygen is sucked in. Because of the insulation in the wall of the rocket stove, hot air is channelled out of the top of the stove making for a more efficient cooking process and requiring only a small amount of fuel. Within the pot the stove is nested. The stove is easy to assemble and is made out of 4 parts. The largest part is the base of the stove with the half grill and the hole in the side. In this side hole fits the side tube. The side tube gets fixed in place with the slide and on top of the base fits the pot-stand.The stove has a natural working. This means there is no need of batteries or fans to make the fire burn well. Because of the insulation in the wall more hot air goes out the top of the stove. This makes that more air flows into the stove. The airflow which is generated flows under the burning wood so it has more oxygen and burns better. Heroclip - One fearless gadget.